AT Reader Shandos Cleaver from Thirroul in NSW has discovered her favourite secret holiday spot is Port Douglas – although not the one in Far North Qld. This one is a secluded bay on SA’s Eyre Peninsula. Before visiting South Australia’s Eyre Peninsula for the first time, a friend of a friend recommended that I visit the small town of Coffin Bay, located far down on the peninsula’s tip. The town’s name stuck in my mind, partially due to it being unusual (although there is no connection with death, the town having been named by Matthew Flinders after his friend Sir Isaac Coffin), but also because I started to encounter Coffin Bay oysters – of which I became a fan – in seafood shops. Arriving at Coffin Bay on the first of June, the start of the low season meant that the boat tours were over for the season and some places shut up, despite the weather still being wonderfully sunny and mild. Heading through the town, I reached Coffin Bay National Park, with its magnificent limestone cliffs facing the thundering Southern Ocean, in contrast to the peaceful beaches along sheltered bays on the other side of the park. As the sun brilliantly set over the distant shorelines of the bay, a glass of wine in hand, it felt like paradise. On one of those bays is the Yangie Bay campsite – the main campsite in the park, being accessible to 2WD drives. Quite a few people were camped at this campsite despite it being mid-week; however, the truly beautiful places to camp are located down the 4WD track that continues on past this site, where not as many people venture. After about a 30min drive, partially through sandy coastal land with deep wheel ruts, but also along rockier ground, I arrived at the Black Springs campsite, located on a bay known as Port Douglas. A far cry from the other port with the same name in Far North Queensland, this Port Douglas was almost deserted, with more kangaroos than campers in residence. 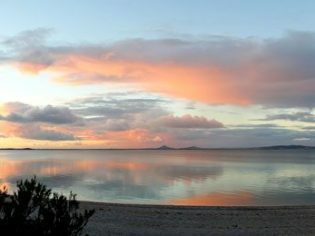 The campsite offers only basic facilities (picnic tables, fire places, bush toilets, a water tank not suitable for drinking), but just a few metres away is its best feature – the serene, deserted shores of the bay. For our first night’s dinner, my partner and I carried our chairs and gas stove down to the sandy beach and made a simple dish of local mussels from Port Lincoln, cooked with a white wine sauce and eaten straight from the pot with crusty bread. As the sun brilliantly set over the distant shorelines of the bay, a glass of wine in hand, it felt like paradise.